Separation from the wife, disgrace from one's own people, an enemy saved in battle, service of a wicked king, poverty, and a mismanaged assembly: these six kinds of evils, if afflicted a person, burn him even without a fire. 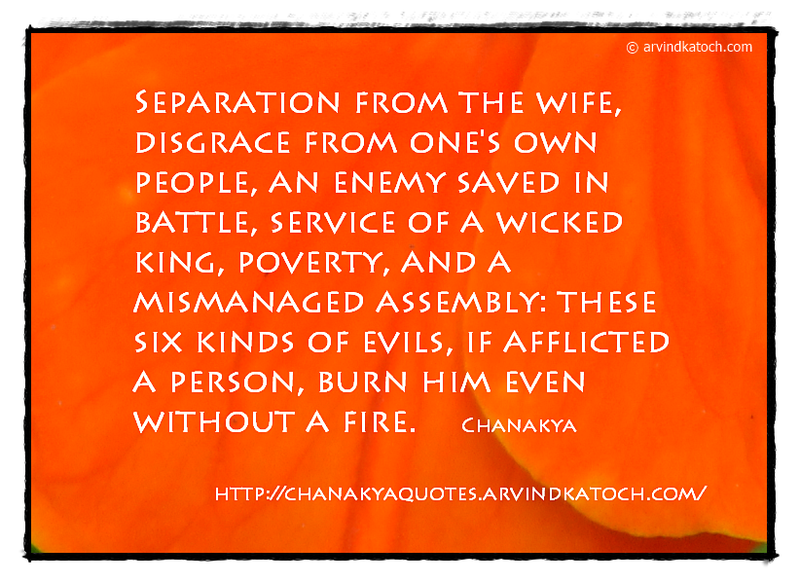 Chanakya Wise Quote Meaning/Explained- In this Quote, Chanakya refers to the six sorrows which burns the person from inside if he is affected by them. For example, For a loving husband permanent separation from his wife, causes a lot of pain and discomfort. Similarly, a person feels pain when he faces above mentioned five other situations. Good effort to provide time tested Wisdom . Arvind..